This ride brought back my childhood love of biking. Got me excited for biking in san francisco even though they are very different! For this presentation i feel like i did pretty well. I was excited to talk about this because i was very personal to me. I think that I did better on not stuttering as much and being able to stand still without unnecessary movement. I am more proud of the improvement i’ve seen over the semester. In the beginning i wrote that a good speaker was passionate and confident an during the first presentation i was definitely not either ronan those things. However having just given my fourth presentation i feel like i achieved both of these skills. I think that the most important usf learning outcome is “Present well-reasoned and appropriately supported oral arguments that are responsive to topic, purpose, audience, and occasion.” i think that this is important because it outlines the main goals of having a clear topic, a purpose, and knowing your audience. Unknowingly i feel like i used this outcome to make my all of my presentations in this class. I really value this outcome. 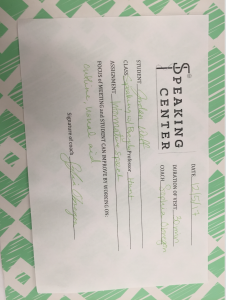 today when I went to the speaking center I scheduled it right before our class so that could try and get my nerves out when presenting to someone else instead of the class. Im not sure if this worked because I didn’t feel like I did very well when presenting to her. She gave me a few pointers on things I could fix and then that was it. personally I think would have liked to run through it at least one ore time with the feedback she had given me. 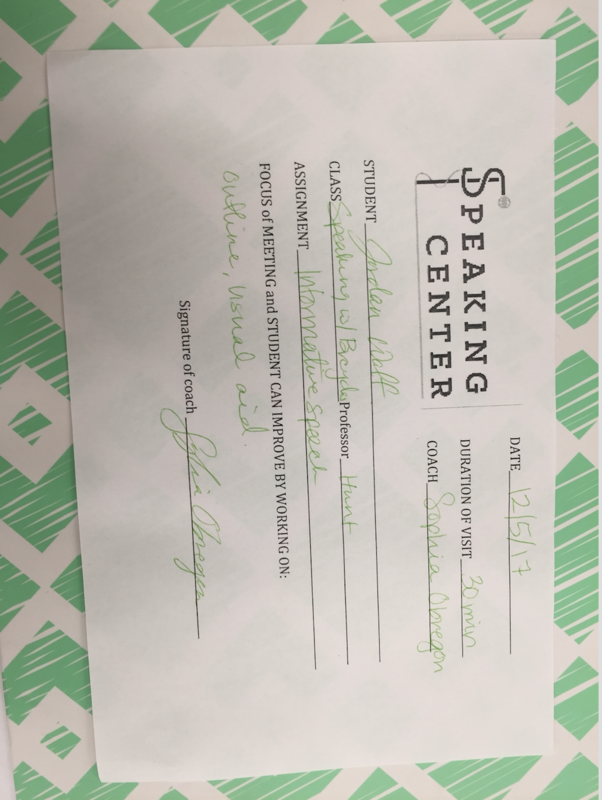 Maybe next time I have a presentation will just practice with a group of people a bunch of times not the speaking center one time.